Astronomers have made the first direct discovery of a white dwarf star being orbited by a disintegrating minor planet that will ultimately collide into it. The observation, made by the Kepler space telescope, offers a glimpse into what could happen to the Earth in a few billion years as the Sun, like most stars, becomes a white dwarf. The study, published in Nature, also adds to a growing number of studies reporting that dwarf stars can have atmospheres polluted with heavy elements – in some cases the constituents of water. Knowing that planets can be the source of such contamination gives weight to a hypothesis that says water on Earth was deposited by rocky bodies from distant regions in our solar system. Most stars, including our Sun, will become white dwarfs as they die – before going out as a black dwarf or supernova – when they have exhausted their nuclear fuel. Our standard model for white dwarfs would predict white dwarfs to have no elements heavier than helium in the atmosphere, but a growing number of measurements of white dwarf atmospheres show the presence of heavier elements such as oxygen, magnesium, silicon and iron. This is surprising because the star's strong surface gravity is expected to cause heavy elements to sink quickly to the centre – leaving simple atmospheres of hydrogen and helium. One explanation for this atmospheric pollution is that rocky bodies with similar properties to those in our solar system collide with a white dwarf and replenish its atmosphere with new heavy elements, including water. However, until now, there was no direct evidence that such rocky bodies exist or could fall onto a white dwarf. The authors of the new study discovered the planet by noticing a dip in the brightness – a transit-like signal – from the white dwarf WD 1145+017 (also known as EPIC 201563164). They also detected similar but weaker signals – all with periods ranging between 4.5 and five hours. Using additional data from a range of Earth-based telescopes, they interpreted these dips as times when low-mass objects orbit in front of the white dwarf, blocking out some of its light. Kepler and the area it is investigating. Although the behaviour of the dips with time is complex, the team thinks that at least six minor planetary objects with masses comparable to or smaller than dwarf planet Ceres orbit the WD 1145+017 white dwarf every 4.5 or 4.9 hours. The bodies appear to be rocky with densities greater than Pluto – at least two grammes per cubic centimetre. They also have comet-like dust tails produced when the incident radiation from the white dwarf heats up their surfaces, causing minerals such as orthoclase and fayalite to form streaming metal vapours. The astronomers also analysed the light from the star itself through spectroscopy and could confirm that it is indeed polluted with elements including magnesium, aluminium, silicon, calcium, iron and nickel. These elements most likely ended up there in the past million years – very recently given the dwarf formed 175 million years ago. What does it mean for the Earth? When our own Sun dies it will initially expand to become a huge red-giant star and engulf Mercury and Venus. Whether it will expand to reach Earth is still a matter of debate. When its nuclear fuel is exhausted gravity will then cause the Sun to shrink down to about the size of the Earth itself but with a density so high that a teaspoon worth of this star would have a mass of nearly 15 tons. This evolutionary cycle could perturb the orbits of other planets in the solar system, increasing the chance that they would collide with each other and ultimately disintegrate and fall into the Sun, just like in the new study. 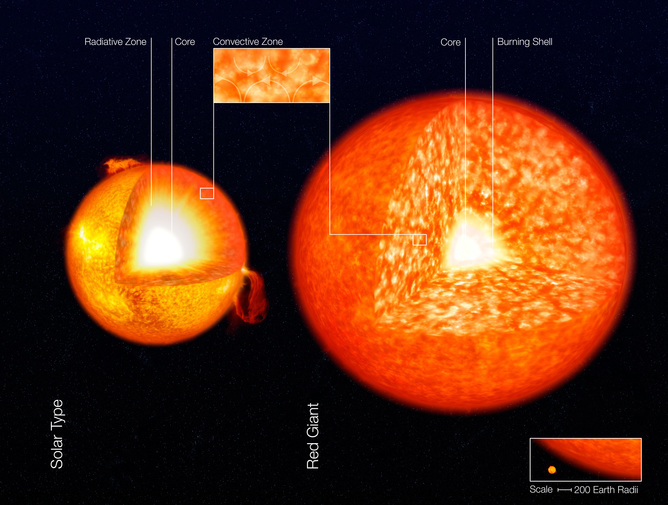 Internal structure of a Sun-like star and a red giant. The research could also help explain another major question in planetary science: whether the water on Earth was already present in the primordial material that formed our planet or whether it was planted here by collisions with other bodies. Earlier this year another white dwarf, SDSS J1242, was found to have an atmosphere polluted with a large amount of oxygen, which raised the possibility that a water-carrying asteroid might have planted it there. But it was not possible to directly detect the rocky debris that caused the pollution in this system. The new study provides compelling evidence for the connection between disintegrating rocky bodies and polluted white dwarf atmospheres. Four billion years ago, the Earth and other rocky planets are thought to have been bombarded by comets and asteroids. 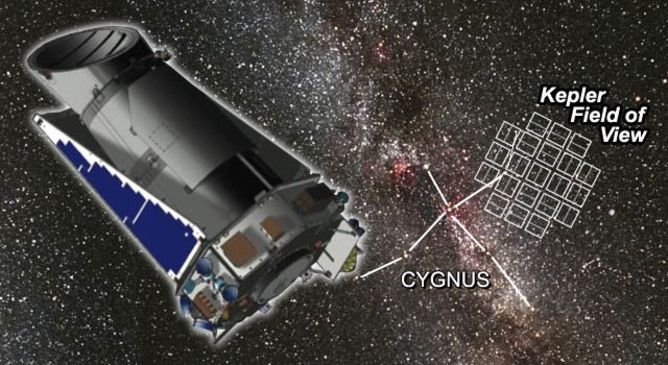 While the asteroids in our solar system are today barren objects, the two studies indicate that they can indeed carry a number of heavy elements. Perhaps 4 billion years ago some of them contained water and perhaps even the complex organic molecules that provided the building blocks of life. The authors hope that future studies of WD 1145+017, and perhaps other systems, with transit spectroscopy might detect the presence of more complex molecules in the dust tails of the ill-fated debris.